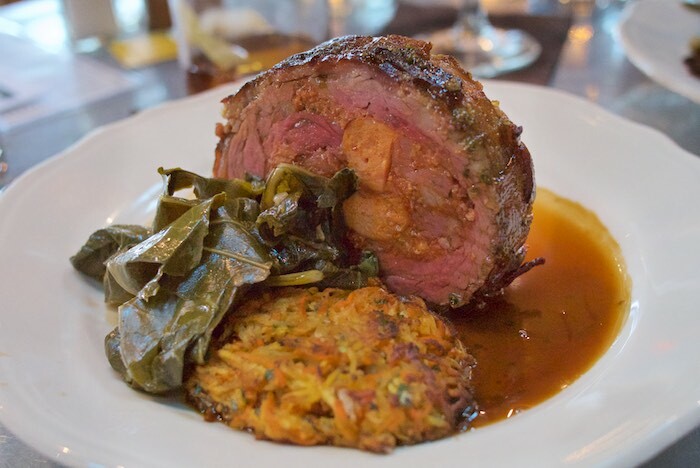 I recently had the opportunity to meet barbecue master Steven Raichlen, while enjoying a three-course meal prepared by Chef Justin Beckett, at Southern Rail. 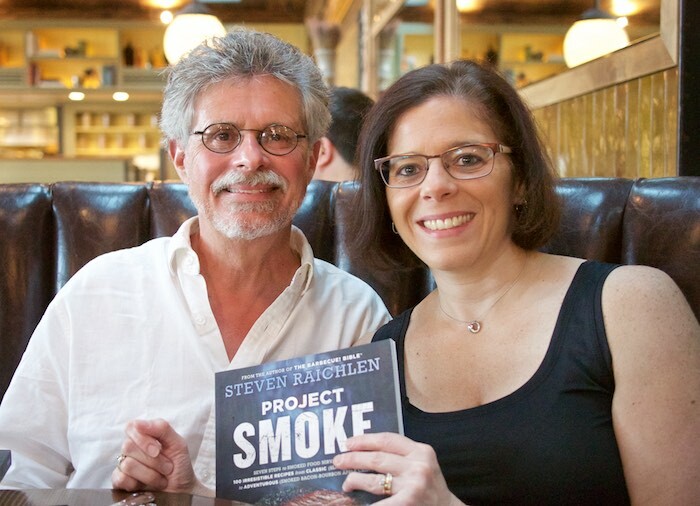 Beckett put together a fabulous smoked meal inspired by the bold flavors found in Raichlen's latest book Project Smoke. Dinner started with a non-traditional smoked dish: Smoked Tomato Gazpacho. 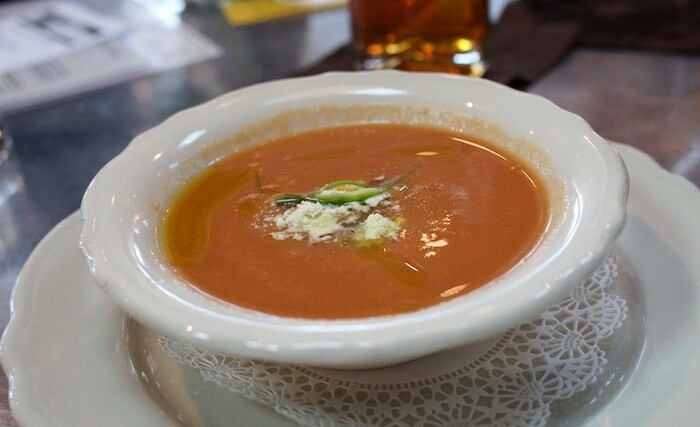 Chef Beckett took the freshest seasonal bounty and smoked it adding a unique depth of flavor to the cold refreshing soup. The gazpacho was followed by the most amazing piece of meat: a bacon wrapped rib-eye stuffed with various types of sausage & chorizo. Talk about delicious, this piece of meat was both tender and full of flavor. As a side dish, Chef Beckett served smoked root vegetable hash and collard greens. Yes, even desserts can be made in the smoker! 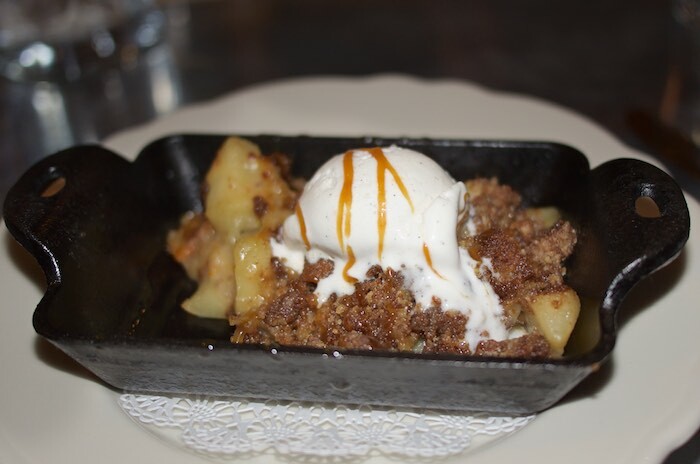 Smoked apples, topped with a house-made gingersnap crumb and bacon pieces were definitely a treat for the taste buds and the perfect way to end the meal. If you are in the Phoenix area or traveling through be sure to check out Southern Rail on Mondays & Tuesdays when you can get a platter of Chef Beckett's delicious BBQ & two bourbons for a mere $20. Also, be on the look-out for other unique events like this at Southern Rail, as you never know what Justin Beckett might have up his sleeve. Bacon wrapped around steak sounds fantastic! Plus those smoked apples with ginger snap crumble sounds so amazing I might have to figure out how to make that at home! Isn't being a food blogger the best! Now I want to get a smoker!! These look delish!! It is so cool being a food blogger. This is a guy I would love to meet. The meat looks good! as it should! How cool! We have a few of his books and they are our favorites! That meal looked divine and I'm especially intrigued by the smoked tomatoes in the gazpacho. It sounds delicious! YUM. I love smokey foods! I went to a smoked meat festival in Prague several years back and it was amazing. My husband would love that bacon wrapped rib-eye, wow. The root hash sounds amazing! A reason to visit phoenix!